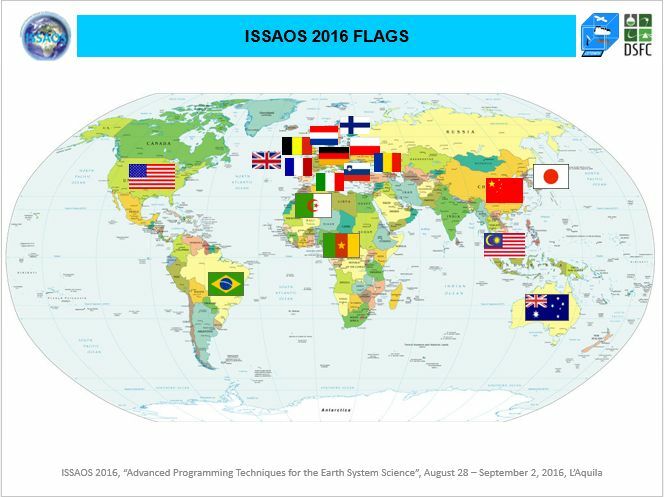 Rachel Harken composed a short story on ISSAOS 2016 from the Oak Ridge National Laboratory perspective. To read the story, click here. ISSAOS 2016: group picture and goodbye! The summer school ISSAOS 2016 has taken place from August 28 to September 2, 2016. 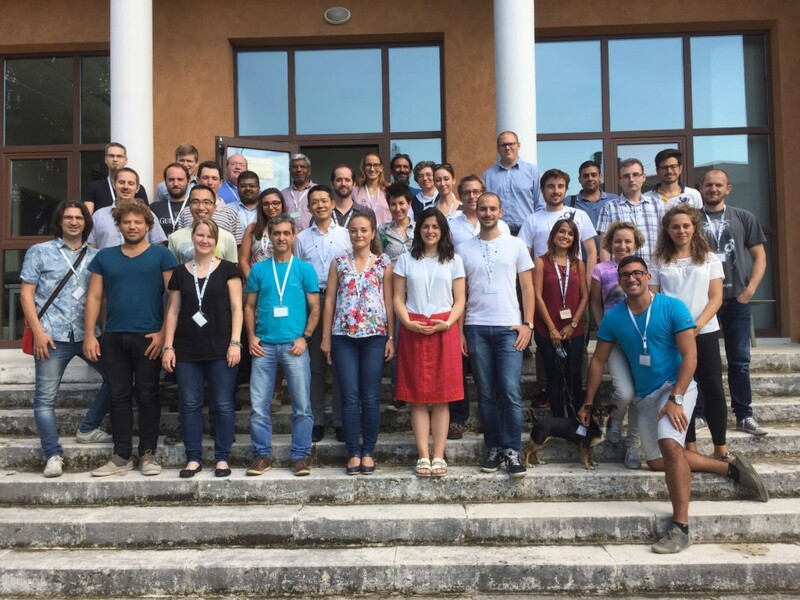 In a very friendly and joyful mood, about 50 participants and lecturers from all over the world gathered together for a week of intense programming on Earth System models. Here below the group picture (with names in the caption), and the school flags on the world map. More pictures on our Facebook page! Goodbye to the next edition of ISSAOS!! From left to right, first row: Gabriele Curci, Vincent Lemaire, Franziska Frank, Jorge Luis Gomes, Corina Bocaneala, Olivia Clifton, Matteo Guidi, Margherita Erriu, Pimpa, Serena Falasca, Daniele Visioni, Barbara Tomassetti. Second row: Dragan Latinovic, Sean Lam, Valentina Colaiuda, Takeshi Enomoto, Lisa Scalone, Michael Long, Romà Masana, Maciej Waruszewski, Matic Savli. Third row: Paolo Ruggieri, Jonas Vlietinck, Kumar Subramaniam, Daven Henze, Marguerite Marks, Francesco Amato, Francesco De Angelis. Fourth row: Marco Paukert, Jaakko Ahola, Timothy Whitcomb, Valentine Anantharaj, Marianna Biscarini, Marco Iarlori, Adelaide Memmo, Matthew Turner. Not in the picture (sorryyyy!!! ): Mike Ashworth, Seung Hun Baek, Huansheng Chen, Peter Dueben, Sabrina Gentile, Donatella Granata, Annalina Lombardi, Ida Maiello, Stefano Stalio, Guocheng Wang, Wenyi Yang, Bob Yantosca, Ziga Zaplotnik. ISSAOS 2016 is about to start!! ISSAOS desk is open from now until 20:00: pass by just to say hi and grab your gadgets! 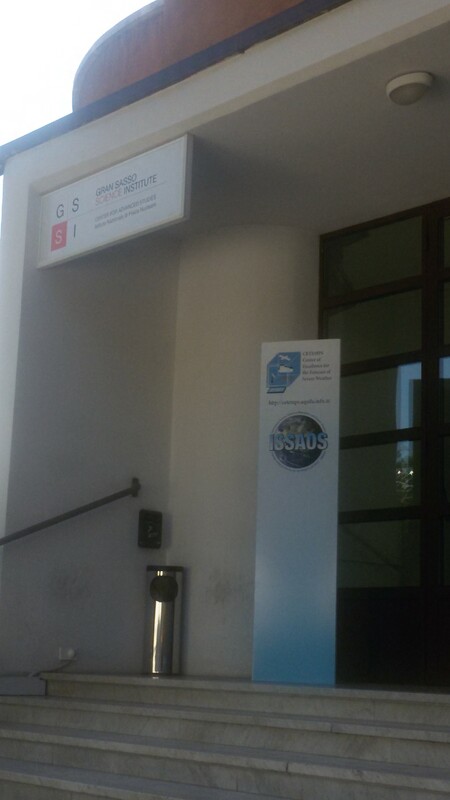 At Gran Sasso Science Institute, Viale Francesco Crispi 7 (see google map tool on this page)! as you might have heard from the news, Central Italy was hit by a series of earthquakes last night, two of which were strong enough to cause damage and life losses (the sad count is 37 at the moment). The earthquakes were felt also in L’Aquila, but there are currently no reported damges to the structures or interruption of services (e.g. we are regularly in the office this morning). The place most affected in the sorrounding is the small village of Antrodoco, about 40 km on the west, where also some life losses are also unfortunately reported. According to our information the situation is safe and there is no foreseen re-sheduling of the summer school. Moreover, L’Aquila is now regarded as one of the safest cities, because of the major earthquake that hit the place in 2009, and it is actually now getting ready to house the displaced people from nearby damaged towns. Warming up for the summer school! the summer school is about to begin in 2 weeks! You will join a group of 45 participants from the five continents, hopefully in a friendly and productive environment. We updated a few tips to getting started with the school. Have a good reading, and see you all soon! At the end of the first day, a Students’ poster sessions has been added to the program, aimed at facilitating information exchange among attendants and lecturers! The issues with the PayPal account were solved and the service is now again up and running to receive payments of the registration fees. Early-bird deadline extended to June 20, 2016! Due to issues with the PayPal account and in order to allow more time to register at a reduced fee rate, the deadline for subscription at an early-bird rate is extended to June 20, 2016! We are working to the solution of the PayPal problem, which will be hopefully be solved soon.